good afternoon everyone, this is my first time in gentoo forum and i'm not good with English either. recently i installed gnome-3.12 and gnome-shell, i followed the wiki about systemd, gnome, dbus, networkmanager and many things that i think needed for installing gnome with systemd on gentoo, but the network indicator didn't show up. 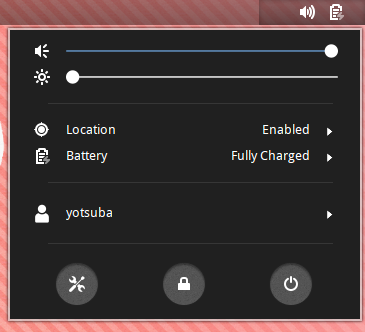 there are no network settings either in the indicator applet. May 31 23:15:52 koiwai NetworkManager: <warn> Trying to remove a non-existant call id. i have looked at some forum with similar problem, but there's no solution for me. and the network indicator still won't show up. usually, i connect using wpa_supplicant, and if a disabled NetworkManager and connect using wpa_supplicant through the terminal, the connection is fine. but network indicator still won't show up. i don't know what log need to be shown in here, so if anyone want to look at another log that i may can provide, i'll add it here. Check if you have 'nm-applet' installed. i already installed nm-applet. And someone fron #gentoo channel on irc freenode said, that gnome-shell use it's own js to provide network applet. i think my problem is on networkmanager service, and i can't figure it out, somehow. once again, thank you for your concern, i really appreciate it.